Not to be confused with Serrana Bank. Serranilla Bank shown on satellite image. Serranilla Bank (Spanish: Isla Serranilla, Banco Serranilla and Placer de la Serranilla) is a partially submerged reef, with small uninhabited islets, in the western Caribbean Sea. It is situated about 350 kilometres (220 mi) northeast of Punta Gorda, Nicaragua, and roughly 280 kilometres (170 mi) southwest of Jamaica. The closest neighbouring land feature is Bajo Nuevo Bank, located 110 kilometres (68 mi) to the east. Serranilla Bank was first shown on Spanish maps in 1510. It is administered by Colombia as part of the department of San Andrés and Providencia. Although the bank is an integral part of Colombia, it is subject to a sovereignty dispute involving Honduras and the United States. 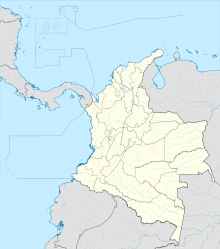 On November 19, 2012, in regards to Nicaraguan claims to the islands, the International Court of Justice (ICJ) found, unanimously, that the Republic of Colombia has sovereignty over Serranilla. Serranilla Bank is a former atoll, now a mostly submerged carbonate platform consisting of shallow reef environments. It is about 40 km in length and 32 km in width, covering an area of over 1,200 km2, almost entirely under water. Three small cays and two rocks emerge above the water to form the bank's islands. These are West Breaker, Middle Cay, East Cay, Beacon Cay and Northeast Breaker. They are largely barren, with sparse vegetation of bushes and some trees. Most of the reef is drying and many shipwrecks are located in its vicinity. Beacon Cay is the largest islet in the Bank. It is overbuilt with small military facilities, which house a small rotating garrison of Colombian naval personnel. There is a lighthouse on a coral ledge in the southwest approach to the bank. It is a 33 m (108 ft) tall skeletal tower built atop a 3-storey crew residence. The lamp emits a focal plane beam of light as two white flashes every 20 seconds. The current lighthouse was first erected in 1982, and was reconstructed in May 2008 by the Colombian Ministry of Defence. It is currently maintained by the Colombian Navy, and overseen by the state's Maritime Authority. The Serranilla Bank was first shown on Spanish maps in 1510 as Placer de la Serranilla. It was mentioned by Louis-Michel Aury whose ship was shipwrecked on it in 1820. In later history it has been the subject of conflicting claims made by a number of sovereign states. In most cases, the dispute stems from attempts by a state to expand its exclusive economic zone over the surrounding seas. Between 1982 and 1986, Colombia maintained a formal agreement with Jamaica which granted regulated fishing rights to Jamaican vessels within the territorial waters of Serranilla Bank and nearby Bajo Nuevo Bank. In November 1993, the two states agreed upon a maritime delimitation treaty establishing a "Joint Regime Area" to cooperatively manage and exploit living and non-living resources in designated waters between the two banks. However, the territorial waters immediately surrounding the cays themselves were excluded from the zone of joint-control, as Colombia considers these areas to be part of her coastal waters. The agreement came into force in March 1994. Nicaragua lays claim to all the islands on its continental shelf, covering an area of over 50,000 km2 in the Caribbean Sea, including the Serranilla Bank and all islands associated with the San Andrés and Providencia archipelagoes. It has persistently pursued this claim against Colombia in the International Court of Justice (ICJ), filing cases in both 2001 and 2007. The United States' claim was made in 1879 and 1880 under the Guano Islands Act by James W. Jennett. Most claims made by the U.S. over the guano islands in this region were officially renounced in a treaty with Colombia, dated September 1972. But whether or not Serranilla Bank was included in the agreement is disputed—there is no specific mention of the feature in the treaty and, as per Article 7 of the said treaty, only matters specifically mentioned in the document are subject to it. According to other records, as well as claims made within the ICJ, Colombia is recognised by the United States as having varying degrees of sovereignty over Serranilla Bank through the treaty of 1972, which took effect in September 1981. The U.S. considers the reef to be an unorganized, unincorporated United States territory. Honduras claims Serranilla Bank as part of its national territory in Article 10 of its Constitution. In 1986, it agreed upon a maritime boundary demarcation with Colombia that excluded Honduras of any control over the bank or its surrounding waters. The ratification of this boundary on 20 December 1999 proved to be controversial within Honduras, as it ensured that the state implicitly recognised Colombia's sovereignty over the claimed territory. Nicaragua, which has not resolved its maritime borders with Honduras or Colombia, disputed Honduras' legal right to hand over these areas before the ICJ. Despite the agreement with Colombia, however, the Honduran government has yet to officially renounce the claim in the Constitution. ^ a b "Sailing Directions (Enroute), Caribbean Sea" (PDF). II (7th ed.). National Geospatial-Intelligence Agency. 2001: 95. ^ (in Spanish) Armada de la República de Colombia: Forces and Commands — area is under the jurisdiction of Comando Específico de San Andrés y Providencia. ^ a b "Mapa Oficial Fronteras Terrestriales y Maritima Convenciones" (PDF). Instituto Geográfico Agustín Codazzi. Retrieved 2009-10-25. [permanent dead link] An official map of Colombian borders, with treaty dates. ^ Lewis, M.; International Justice (20 April 2011). "When Is an Island Not An Island? Caribbean Maritime Disputes". Radio Netherlands International. Retrieved 2011-05-11. ^ International Court of Justice (2012). "Territorial and maritime dispute (Nicaragua vs Colombia)" (PDF). Retrieved 2012-11-27. ^ a b Sanandresislas – description and photographs of Serranilla Bank. ^ Shipwrecks in the Americas, Robert F. Marx. New York (1987), p. 414–17. ISBN 978-0-486-25514-9. ^ "Anexo 7" (PDF) (in Spanish). Colombian Government, Ministry of National Defence. August 1997. Archived from the original (PDF) on 2011-10-09. Retrieved 2009-12-22. Legal status of the Banks of Serranilla and Bajo Nuevo, page 8. ^ "Contract No. 153" (PDF) (in Spanish). Colombian Government, Ministerio de Defensa Nacional. February 2008. Archived from the original (PDF) on 2011-07-07. Retrieved 2009-10-23. Contract detail between Colombian Defense Ministry and private contractor, Tecnosoluciones Ltda, for the replacement of various metal lighthouse structures, including on Serranilla Bank. ^ "Grupo de Señalización Marítima del Caribe" (PDF) (in Spanish). Colombian Government, Ministry of National Defence. May 2008. Archived from the original (PDF) on 2011-07-07. Retrieved 2009-11-16. Photographs of Colombian lighthouses, with Serranilla Bank shown, pages 4–5. ^ Viaje del general Aury a Santafé por el Magdalena, Ch. XII, p.
^ "Fishing Agreement Between Jamaica and the Republic of Colombia" (PDF). United Nations. November 1982. Retrieved 2009-11-20. Fishing agreement which permits regulated fishing rights to Jamaican vessels around Bajo Nuevo and Serranilla Banks. ^ a b Charney, Jonathan; American Society of International Law (2004). International Maritime Boundaries, Vol. 2–3. Boston, United States: Martinus Nijhoff Publishers. p. 2616. ISBN 978-90-411-0345-1. p2179-2192. ^ "Colombia Jamaica Joint Regime Treaty" (PDF). Retrieved 2011-11-13. ^ "Sentencia No. C-045/94" (in Spanish). Government of Colombia, Secretaría del Senado. February 1994. Archived from the original on 2011-07-07. Retrieved 2009-11-22. Review of the 1993 Maritime Delimitation Treaty between Colombia and Jamaica. ^ "Continental, Coastal and Marine Ecosystems of Colombia, 1 of 36" (PDF). José Benito Vives de Andréis Marine and Coastal Research Institute (INVEMAR). 2001. Retrieved 2009-12-22. Topographic map of the Colombia-Jamaica Joint-Regime Area, with the two exclusion circles shown. ^ a b c "The Republic of Nicaragua v. The Republic of Colombia, CCJ Case File" (PDF). Archived from the original (PDF) on 2011-10-09. Retrieved 2011-11-13. ^ "Territorial and Maritime Dispute" (PDF). International Court of Justice. December 2007. Retrieved 2009-11-17. Nicaragua v. Colombia, Preliminary Objections. ^ [WorldStatesmen.org — lists the bank under the United States "U.S. Unincorporated Possessions"] Check |url= value (help). World Statesman. ^ "Acquisition Process of Insular Areas". U.S. Department of the Interior, Office of Insular Affairs. Archived from the original on 2012-04-14. Retrieved 2008-01-13. ^ Moore, John Bassett (1906). A Digest of International Law, Vol. 8. Washington, United States: Government Printing Office. p. 788. ISBN 978-1-4432-8111-9. p77. ^ a b "Acquisition Process of Insular Areas". United States Government, Department of the Interior. Archived from the original on 2012-04-14. Retrieved 2008-01-13. lists Serranilla Bank as an insular area under U.S. sovereignty. ^ "Revisions to the Table of Frequency Allocations" (PDF). United States Government, Federal Communications Commission. Retrieved 2008-01-13. States on page 3 that Serranilla Bank is no longer under U.S. jurisdiction; transferred to Colombia effective September 1981. ^ "Application of the U.S. Constitution" (PDF). United States Government, General Accounting Office. November 1997. Retrieved 2008-01-13. Page 39 states that U.S. sovereignty over Serranilla Bank is disputed. "Currently, the United States conducts maritime law enforcement operations in and around Serranilla Bank and Bajo Nuevo consistent with U.S. sovereignty claims." This is the only archived document from this source that mentions Serranilla Bank as an insular area. ^ "Key Elements of the Honduras-Nicaragua Territorial Conflict". Zamora, Augusto; Central American University. January 2000. Retrieved 2009-10-10. ^ Nicaragua-Honduras Territorial Dispute Archived 2009-09-27 at the Wayback Machine De Mar, Rebecca. American University, June 2002. This page was last edited on 15 March 2019, at 20:29 (UTC).